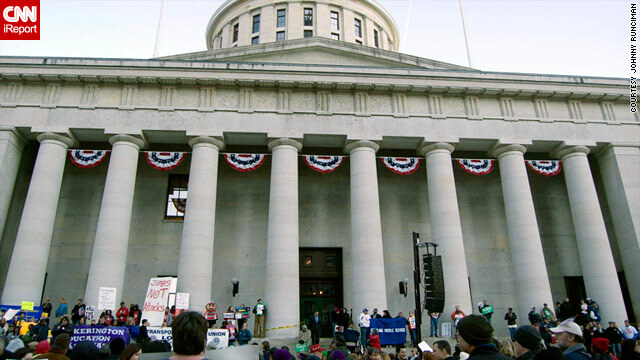 Thousands rally this week at the Ohio Statehouse in Columbus as lawmakers consider curbing some collective-bargaining rights. (CNN) -- The Ohio state Senate passed a bill Wednesday that would curb the collective bargaining rights of public workers and strip away their power to strike. Lawmakers approved the measure by a count of 17 to 16, with six Republicans voting in opposition. The bill, known as Senate Bill 5, is supported by Republican Governor John Kasich. It would curb a 1983 Ohio state law that affords collective bargaining rights to public employees. "No surprise," said Senate President Tom Niehaus. "I've been saying for weeks that we have the votes to pass this bill. It reflects the diverse interests that our members have around the state of Ohio," he said. The near-500-page proposal was modified Tuesday with Republican-supported amendments cobbled into a single omnibus package. Modifications include new measures to settle workplace arbitration, limits on worker vacation and an end to their ability to negotiate health care and automatic pay raises based on seniority. The amended legislation would also restore collective bargaining rights on wages but ban strikes by all public-sector workers, imposing fines and terminating employment contracts for those who defy the ban. Democratic lawmakers described the proposal as union-busting. Their GOP counterparts argued that it's needed to tackle an overreach of union influence they regard as an impediment to fiscal reform. "It passed by the most narrowest of margin," said Democratic State Senator Joe Schiavoni. "That really shows how much public outcry on this bill. That they can change a 27-year-old law in three weeks is scary." Meanwhile, protesting crowds gathered in Columbus, Ohio, chanting slogans like "Shame on you!" following the Senate vote. Earlier Wednesday the measure sailed through a Senate Labor Committee following a last-minute GOP shuffle that resulted in the replacement of Republican Senator Bill Seitz. Seitz said he mostly supported the bill, and the need for collective bargaining reform, but disagreed with a provision that would allow employer management to "impose its will on the final terms of the contract when fact-finding and mediation fail." "That violates the fundamental principle that one cannot be simultaneously a judge and an advocate in his own cause," he said, calling for an "elected, independent, neutral" party to adjudicate those cases involving state workers. The bill now moves onto the Republican-controlled House where lawmakers are expected to take up the measure on March 10. Ohio, often considered a battleground for presidential politics, faces an $8 billion shortfall in the next two-year budget.